Historic Sailboat Project Supports UN Treaty to Ban Nuclear Weapons. Sailing vessel Golden Rule crew member and Golden Rule Project Ambassador, Zoe Byrd, will show the 25-minute documentary, “Making Waves: Rebirth of the Golden Rule” about four Quaker peace activists, led by Navy veteran Albert Bigelow, who in 1958 tried to sail to the Marshall Islands to stop nuclear bomb tests. The boat sank in 2010 and was rebuilt in Humboldt Bay, California. The Golden Rule, a Project of Veterans For Peace, is now “Sailing for a Nuclear-Free World and a Peaceful, Sustainable Future”. VFP Chapter 132 member Dr. Linda Marie Richards, OSU School of History, Philosophy and Religion will also speak. Byrd, Knight, and Dr. Richards, all participated in the Great Peace March for Global Nuclear Disarmament, a nine and half month walk from LA to DC in 1986. The three will answer questions and discuss nuclear abolition with the audience following the films. 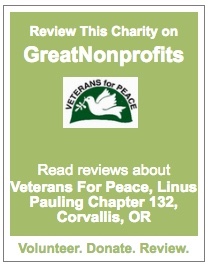 Hosted by Veterans For Peace, Linus Pauling Chapter, Corvallis, the FUMC Make Peace / Faith in Action Team, and the OSU School of History, Philosophy and Religion. The event is free and the public is welcome. Donations will be gladly accepted for the Golden Rule Project. Please note: There will also be an OSU campus event featuring the same films and speakers on February 1, 3:30pm, in Milam Hall, Room 319. This entry was posted in Foreign Policy, Human War Toll, Linus Pauling Chapter Actions, Peace Activism and tagged anti-nuclear activism, golden rule, nuclear weapons, VFP, vfp linus pauling. Bookmark the permalink.